The Servant Sisters got everything ready and the Servant Priests ran the retreat. 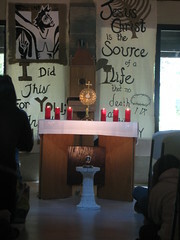 About 60 young people aged 18-30, from Florida and elsewhere, attended the retreat. Thanks to the generous contribution of different groups from around Jacksonville, the meals were all donated. Thus the price of the retreat was no problem for the young people, so that they could take advantage of the opportunity. In the H.M., we lead the silent retreats in the style laid out by St. Ignatius of Loyola in his Spiritual Exercises. It was a challenge for the Servant Priests to turn what would be an eight-day retreat into one little more than 24 hours long; yet they took advantage of every second they had. 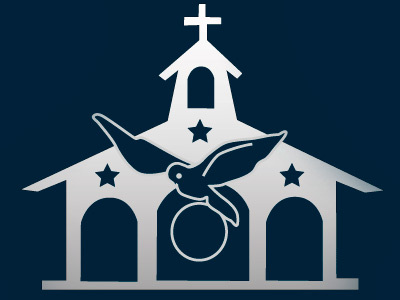 The schedule included daily mass, seven talks, time for personal prayer before the Blessed Sacrament, confession, the movie ¨The Passion¨, and turns for adoration during the night. We also listened to the book ¨He Leadeth Me¨ by Walter Cizcek, S.J. during the meals. After lunch on Sunday, the young people shared their experiences of their time in silence. For a number of them, it was a moment of going deeper into their prayer life, becoming aware of what God was asking of them, and also an opportunity to make decisive resolutions and to give their heart completely to the Lord. We give thanks to the Lord for all good things He gives us!